The no freezer required, individually-packaged PretzelHaus 6 oz. unsalted pretzel is a practical, profitable treat for your concession stand, convenience store, carnival, golf course, or swimming pool! Since these shelf stable pretzels are never frozen, preparation time is shorter than that of frozen varieties, and there's no risk of serving a pretzel with a cold center. Simply microwave the hand-twisted snack to an ideal temperature in as little as 25-30 seconds. Alternately, they can be warmed to 110-120 degrees Fahrenheit using any standard foodservice warmer, convection oven, or toaster oven. When microwaves or warmers are unavailable, these pretzels can even be served straight from the pack since they remain soft, moist, and maintain an even consistency. 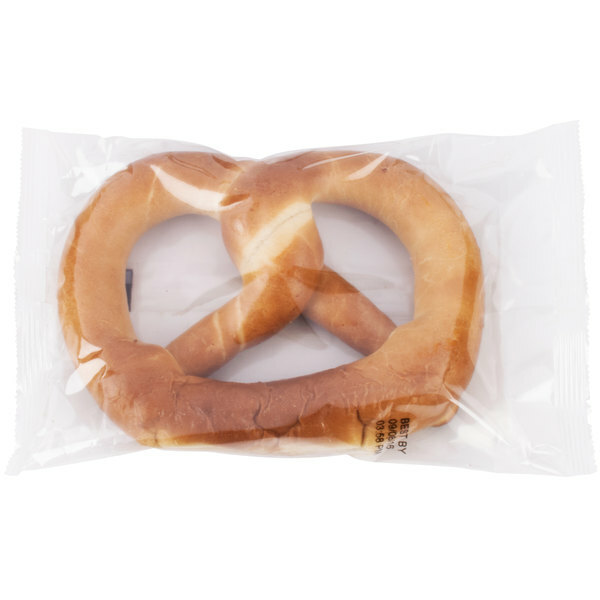 PretzelHaus soft pretzels boost your concession impulse sales while dramatically extending your holding time. Individually-packaged to seal in flavor and moisture, these plain pretzels are healthier than other varieties with salt and sugar. If you'd like to control the amount of salt on your pretzels so they're not too heavily salted, these unsalted pretzels give you the perfect opportunity. Simply spritz the pretzel with butter or water, sprinkle with salt, and heat it up! The combination of the baked, golden brown outside and the soft, doughy inside make this pretzel the perfect treat for any time of day. 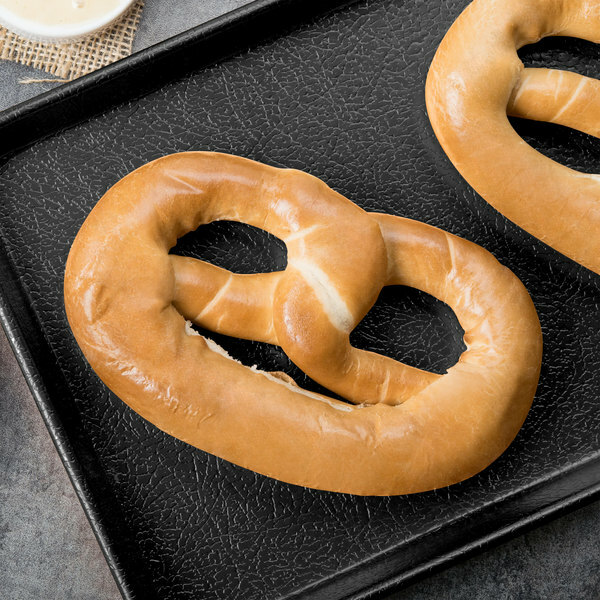 To save you time and money, PretzelHaus pretzels arrive ready to heat and serve. These are nice soft pretzels, you just microwave them for 30 seconds and they are hot and ready to eat! If you want it to be a salted pretzel, brush with oil and sprinkle with kosher salt. These unsalted pretzels come in plain packaging, not retail packaging like the other varieties. A nice unsalted pretzel that makes it easy to create different flavors at your own stand. The pretzels are fluffy and really tasty. The price is perfect and really leave ample room for good markups. The price is great and the taste of these unsalted pretzels are phenomenal. The unsalted pretzels are great for adding my own seasonings and creating delicious gourmet pretzels. A good general pretzel. I like the fact that they are individually package - very convenient - little chance of waste while storing - and that they can be heated, stored if unsold, and reheated again later. We ordered all 3 types from Webstaurant - salted, plain, and cinnamon flavors. The only thing is I was a bit disappointed because the "salted" variety doesn't taste much different from the "plain/unsalted" variety. The salted version does NOT contain the big chunks of salt that some customers like, but rather, it claims that the salted flavor is added to the dough itself. We couldn't really tell any difference between the two taste-wise. These are really good. I prefer the unsalted ones and to leave them unsalted. They are good as is but even better when dipped in yellow mustard. Some enjoy cheddar and ranch dipping sauces too. These pretzels are much better than the frozen pretzels we had been selling. Great price for a great pretzel. Short cook time and nice taste.